I’m super excited to announce that my flash fiction, “Independence Day,” has been accepted for publication by Allegory Ridge. You can read it here! A big thank you to Alexander Rigby and his crew for publishing my unconventional little story. Here I am with some of my classmates after the hooding ceremony at Creighton University. How’s it going, friends? How’s your writing and reading life? Feel free to post in the comments section about your own journeys. In the meantime, I’ll give you an update on where I am with my journey. It’s been quite a while since I’ve posted on my blog, so I feel as if there is a great deal to catch up on. That being said, I’ll give you the condensed version—we all have a lot of reading and writing to do, right? As of mid-May, I’m officially an alumna of the Creighton University MFA program. It was an honor and a privilege to study under Dr. Brent Spencer, Professor Mary Helen Stefaniak, Professor David Mullins, and Professor Susan Aizenberg. Each of them taught me important things about the craft in their own ways. I was exceedingly grateful to put together a collection of short fiction for my thesis with Mary Helen’s guidance. I’m hoping to have a few more of the individual short pieces published—but my thesis project overall may be a collection I eventually submit to publishers for consideration. More revision would be involved before any such decision could be made with certainty. My longer works, however, continue to be problematic. Two of my novels died in the MFA program—or rather, I filed them away for now to work on my current novel. That being said, I learned a great deal about my particular weaknesses and hope to overcome them with my new project. I’ve finished with my Blue River responsibilities. It was an interesting start to a journal that I hope will continue to be published by the Creighton MFA program. The latest issue recently came out, so don’t forget to snag a copy. Post-graduation life is, simply put, calmer and more manageable. After an intense summer internship last year, I started working as a contract employee for Tethered by Letters. It’s been a learning experience—I’ve never worked as anything other than a regular employee before—but the challenges have helped me grow as a writer, editor, and publisher. I’m currently the publishing assistant for TBL and I work as the editorial assistant for F(r)iction—TBL’s triannual literary and art journal. Broadly, my responsibilities concern everything from intermediate updates to the website, to social media marketing, to F(r)iction assginments and editing, to pretty much everything F(r)Online. F(r)iction recently was picked up by Barnes & Noble and other select chain, independent, and college bookstores—so we’re in the brick and mortars nationwide (and Canada too)! Pick up a copy of the journal at a bookstore near you and check out the amazing art and literature that we publish. My most recent publication, “One Woman’s Junk,” is a flash fiction story that was featured in Newfound‘s web issue: Vo. 8, Other Worlds. I’ve read and admired the flash fiction Newfound has published for some time now—so to have my work published by them is quite an honor. The editors are also incredibly kind. Be sure to check out and support this wonderful nonprofit publisher. In January, my flash fiction story, “Force Play,” was published in issue #1 of Obra. This excellent digital magazine, produced by the MFA of the Americas, makes for a great read. I was thankful to work with the considerate editors on staff. Go check out what great literature and art they have to offer. The online and print versions of Vestal Review #49/#47—in which my flash fiction story “Trace” was published—are also now available to read. Vestal Review has been publishing flash fiction since 2000 and are “the world’s oldest magazine dedicated exclusively to flash fiction.” They also recently published their fiftieth issue, which you can read here. This summer is shaping up to be a busy one. I’ve been submitting many of my short stories and flash fiction creations to journals and magazines. I’ll be participating in workshops in Omaha and online—because quality critiques often lead to better work. I’m working on that novel—consistently, desperately. And when things get overwhelming, I’ll be playing in my garden dirt. Thanks for stopping in again, friends. And as always, thanks for reading. Blue River began at the start of this academic year, so we’re excited to be open for submissions already. We also introduced the Blue River Editors’ Award, which has a monetary prize. 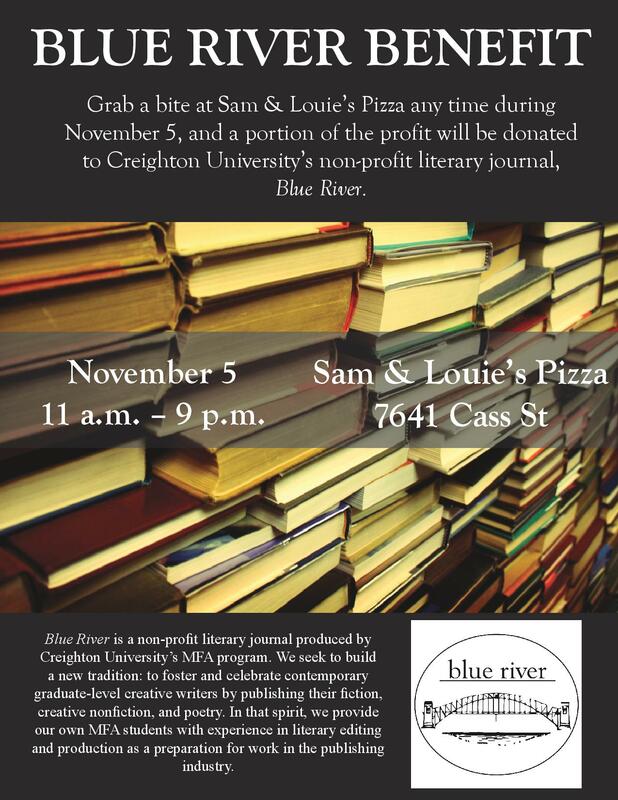 We seek to support writers and you can too—simply eat out at Sam and Louie’s Pizza (7641 Cass Street, Omaha, Nebraska 68114) anytime November 5. As a nonprofit organization devoted to elevating artists, we would really appreciate your support. Thanks for considering our cause! If you’d like to learn more about Blue River and our mission, visit us at our website and follow us on Twitter and Facebook. We hope you’ll consider reading our first issue when it comes out in March.